Since I started Litter Picking in The Forest of Dean (see blog post Litter Picking Is Cool) I am even more interested in the opportunity of reuse and recycle. The obvious solution was to start The Magic Roundabout Tango Marketplace for Tango Shoes, Clothes, Books and more. It’s time to de-clutter your tango wardrobe. Bring pre-loved, good quality tango shoes and tango clothes to sell or exchange to The Magic Roundabout Milongas in Lydney. How To Join The MR Tango Marketplace? 1. Let me know that you are coming by joining the FB event. 4. Come to the milonga, enjoy the music, dance and pass on your pre-loved tango items at the same time. 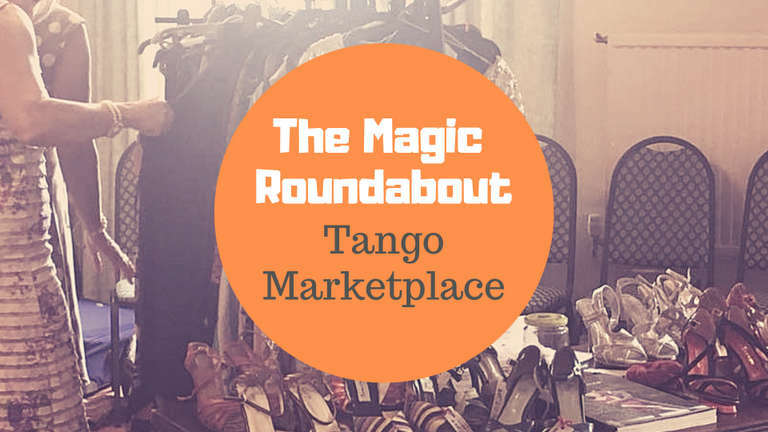 *) In case you decide NOT to upload any picture and NOT to share the FB event you still can join The Magic Roundabout Tango Marketplace for a small FEE of 5 GBP. Send me an email to info@movingexperience.eu instead. All Magic Roundabout Milonga FB Events.